Deliverability is an ever-changing and important piece of a strong email marketing strategy. Several different parties are responsible for your email deliverability. You cannot relinquish your responsibility for your email delivery to your technology partners, and the reverse holds equally true. 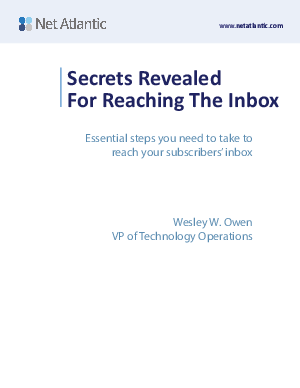 In this whitepaper you will learn what is hindering your delivery rates and what you can do to increase your chances of getting into your subscribers’ inboxes. While an Email Service Provider (ESP) will be responsible for aspects such as infrastructure, bounce handling, message throttling, authentication, and ISP relationship management, you the sender will control how the data is being collected, frequency of contact, quality of targeting, relevancy of the messaging, and the quality of the content. All of these factors affect your reputation, and both parties have vital roles to fulfill in this regard. Let’s take a closer look at the factors you are responsible for.